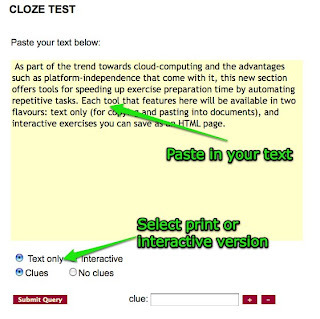 I've just spotted this very handy Cloze test creator that allows you to create your own cloze text exercises in either paper based or interactive form. You simply type or past in your text then select either the types of words or the number of spaces between words that you want taken out of the text. You can also add clues, so that you can provide all the missing words and students just decide which ones go where. Once you have decided on the number of or type of words you want taken out of the text, you select either text only, for a printable classroom version or interactive to create an interactive online version of the exercise. This is a great little tool for reviewing texts and building learner autonomy, especially the online version. You can ask your students to take texts they have studied in class and create and test themselves on various aspects text just by copying it in and clicking. Great free tool. Just a shame you can't save the interactive versions you create. Tom Cobb's Lextutor CLOZE tool is not as user friendly, but is well worth a visit to http://www.lextutor.ca/cloze/ Tom has done a lot of work on the tool based on requests by users, so it is a pretty sophisticated way of creating an interactive CLOZE tool. 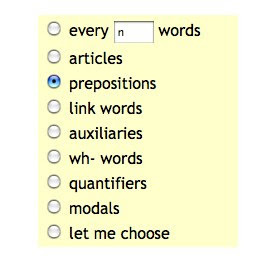 His options to CLOZE words based on frequency bands is great...and based on principled research into word lists. Although I've used, and recommended, Lucy Georges' cloze creator, it doesn't work properly, especially when I want to remove words of my choice. Unfortunately, she doesn't acknowledge emails or suggestions. I've also tried Steve Neufeld's suggestion, but it didn't 'check' the answers. I've been looking for an interactive cloze creator for some time now, but without any luck. If you happen to find one in good working order, please let me know! If you are prepared to but a bit more time in you can create them using Hotpotatoes I think http://hotpot.uvic.ca/. You an also save them and upload to a server for online delivery. Yes, I was just about to say that Hot Potatoes still is the best for cloze activities. Ok, it can be rather tiresome to set it up, but at least it works. Incidentally, Lextutor works in IE but not in Chrome. Shame. Wonderful tool to develop reading comprehension as well as provide some guidance in appropriate use of words. Good tool for beginners, and can be modified to meet the challenges of advanced learners. I had earlier used a Dos version and this is infinitely better with DOS becoming almost obsolete.